One of the real Holy Grail pieces of Psych vinyl. 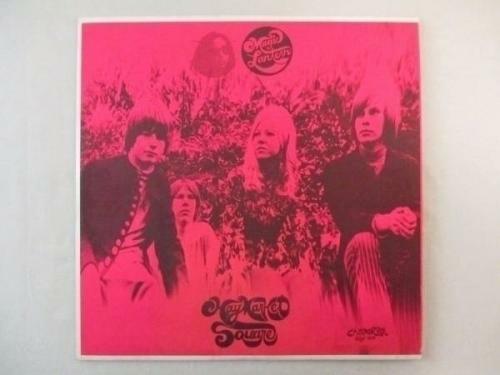 The LP we are offering here is an absolute original private label pressing of this hard to find record album, released in 1968. This record album recently surfaced after having been in storage in Nashville, Tennessee for many years. COVER: The cover is very nicely preserved. The cover consists of a plain white jacket, somewhat thicker than you find nowadays, with color inserts slightly smaller than the jacket itself neatly adhered to the front and back. The jacket style is unusual, and the jacket itself has no seam splitting, nice and crisp edges, and three great corners. The bottom right corner edge has a small ding and a small rub. There are some areas along the bottom edge with light staining. The attached color inserts still have vivid color and look great overall. If you look closely there is a small amount of light surface wear and a few light rubs just here and there. The insert attached to the back has a handful of very small chips toward the bottom on the extreme left edge, so small it would be hard to accurately measure, and we do not know if the insert was this way when the record was manufactured or if this occurred later. We are grading this cover a nice EX. VINYL: We carefully played some of both sides of this LP to see how it sounded. The record looks like it has had very little play, and it plays very well and has a good strong sound. The record shows some visible cosmetic surface marking from the paper inner sleeve being against it for so many years, and interestingly the original inner sleeve (which we are including) had a fold in the bottom left corner when it was originally inserted into the cover and you can see a section of surface marking on Side A of the record itself in the shape of the fold. Visibly, this record grades about VG+, but it plays better. There are no marks on either side anywhere close to being able to be felt on the LP. Also, the record has a very light warp, which in no way affects play. The LP weights 160 grams. All of our LP's are shipped in sturdy cardboard LP mailers with appropriate padding. With the exception of sealed LP's, all LP's are removed from their outer sleeves to prevent seam splitting. Upon request, we will give your sealed LP's the same treatment. All records are carefully graded. In an attempt to give customers an accurate impression of condition rather than adhere to somewhat arbitrary criteria, The Great Escape gives an "overall presentation" grade; we do not give a "listening" grade. Our vinyl listings are supplemented when necessary with additional remarks. For example: where some dealers will not allow a cut corner on an otherwise near mint jacket (often automatically relegating it to a VG+ at best), we may grade such a record as NM and note the cut-out mark (thereby letting you know what it "really" looks like: a near-perfect record with a cut corner). LPs are graded cover first, followed by the grade for the vinyl. We describe all items to the best of our ability and knowledge, and we image everything that is included for each listing. If you have any questions regarding a description or pictures, please contact us for help. You may also continue purchasing additional items from our auctions or eBay store. You have 7 days from the end of the first purchase to add additional items to your order. Please note that Unpaid Items Disputes will open on any item after 4 days without payment. You still have the full 7 days to submit payment on those items. Because of our volume we automate this process and cannot turn it on/off for individual orders. Make sure all of your auctions have ended prior to checking out. All of your purchases will be consolidated into one checkout! You have 7 days from the end of your purchase to complete your order. Please note that an Unpaid Items Dispute will open on any item after 4 days without payment. You still have the full 7 days to submit payment. We accept all site-approved payment methods, including Credit Cards and Paypal. 9.25% Sales Tax Collected In Tennessee. Domestic (all 50 states, U.S. territories, APO/FPO & P.O. Boxes) shipping rates are calculated based on package weight & destination. The international shipping rates are calculated based on package weight & destination. These charges are the buyer's responsibility. Please confirm with your country's customs office to determine what these additional costs will be prior to bidding/buying. Due to U.S. regulations, we cannot ship items as gifts or as a sample. We identify the shipment with the description of contents and total value paid.